Fabric Mart Fabricistas: Fashion Challenge #3 - Inspired by Ready-to-Wear -- What They Made!! Fashion Challenge #3 - Inspired by Ready-to-Wear -- What They Made!! 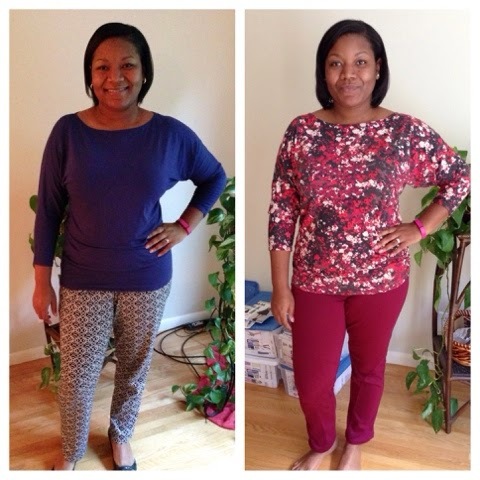 We're in the 3rd week of the Fabricista Fashion Challenge! In this week's challenge, contestants were asked to create a new garment based off of a RTW garment in their wardrobe. They were also asked to blog about the process on their own blogs. This way they can explain about it in as much length as they would like and were also able to put as many photos in it as they would like! Scroll through the submissions and vote for your favorite! (Voting link is at the bottom of this blog post.) Be sure to click on each contestant's blog link to read about their process in making a new garment from a RTW garment. This week's challenge will be judged my myself (Julie) and Dana Bontrager from Dana Marie Designs! Dana has her own line of fashion patterns. I interviewed her back in June. Read the interview here. Winner of this challenge will receive a Free Knit Bundle and three free patterns of their choice from the Fabric Mart Pattern collection. I bought this navy sleeveless top from The Limited a few years ago, and reach for it often. The neckline is flattering, the fit is perfect for me, and it’s versatile enough that I can wear it with just about anything. Why, oh, why didn't I buy it in every color? So, for this challenge, I decided to copy it. I’ve looked at it from the inside before, and was very curious how they put it together. The front neckline was a mystery to me. Was that a dart? Or a pleat? Or ruching? I honestly sat and looked at this piece for a couple of hours, scratching my head, as to what this pattern was going to look like. This is when you really start to appreciate all of the work that pattern designers do! I gathered measurements from the original top, transferred this to my plastic sheeting, and got a pretty good idea of how they put this thing together. It really was clever. What looked like it could be separate pieces, was actually just one piece that was slashed, gathered , folded, and pleated. I made up a muslin. Not perfect, made a few changes. Now was the time to transfer this to my pattern paper marking all of the important points. I cut out my teal green jersey and transferred the markings precisely using a tracing wheel and colored wax paper. My jersey is a little thicker than The Limited top, but I’m pretty thrilled with how this mimics the original! It only takes ¾ yard of fabric, and I can see making this up in a bunch of colors and prints. I was so happy when I received this week’s challenge! As much as I love sewing my own clothes, I’m constantly inspired by RTW fashion. I decided to copy a dress that I’ve had for about 3 years and worn regularly, even though it’s actually a maternity dress! To create the pattern, I used a combination of patternhacking, the rub-off method, measuring, and guessing. You can read the full report on my blog. There were certainly some challenges to duplicating a maternity dress, but I was determined to make it work! I dutifully copied my favorite parts of the inspiration dress, like the waistband shirring, the cowl neck, and even the hidden modesty panel inside the bodice. The hem is tiered for much-appreciated extra weight, keeping the skirt nicely in place. 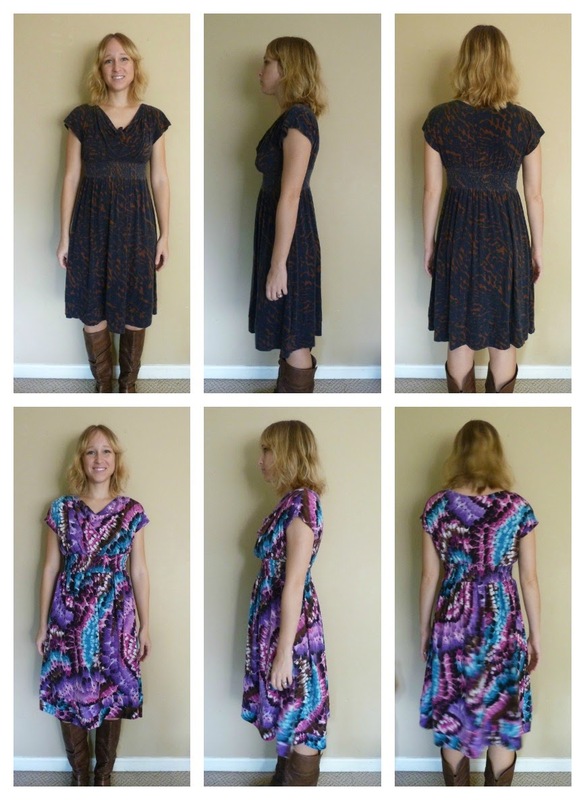 The original dress is a medium weight rayon/spandex knit, so I selected a similar cotton/rayon/spandex knit from my stash. Both dresses are so soft and comfortable, pregnant or not! Copying this dress was an amazing challenge, and I can't tell you how awesome it feels to be wearing an exact replica of something I've loved for a long time. I learned a lot, tried some new things, and now I have a beautiful dress to show for it! In June 2013 I decided to finance a Bernina machine from my local fabric store. Eventually I decided on which machine would be my "forever" machine (it dang well better be!) and when I went to the stores to sign the papers, I was wearing one of my most favorite summer sundresses, the Garnet Hill Knit Tiered Sundress (which you can see on me here in this post--second to last photo). As I was walking around waiting to get the paperwork in order, one of the managers there looked at my dress and said, "well, now I guess you can make yourself a version of that pretty dress with your new machine." I just kind of chuckled, thinking he was putting WAY too much stock in my abilities as a sewer. Little did I know that eventually he would be right, but it took Fabric Mart's Fashion Challenge competition to make this dream a reality. 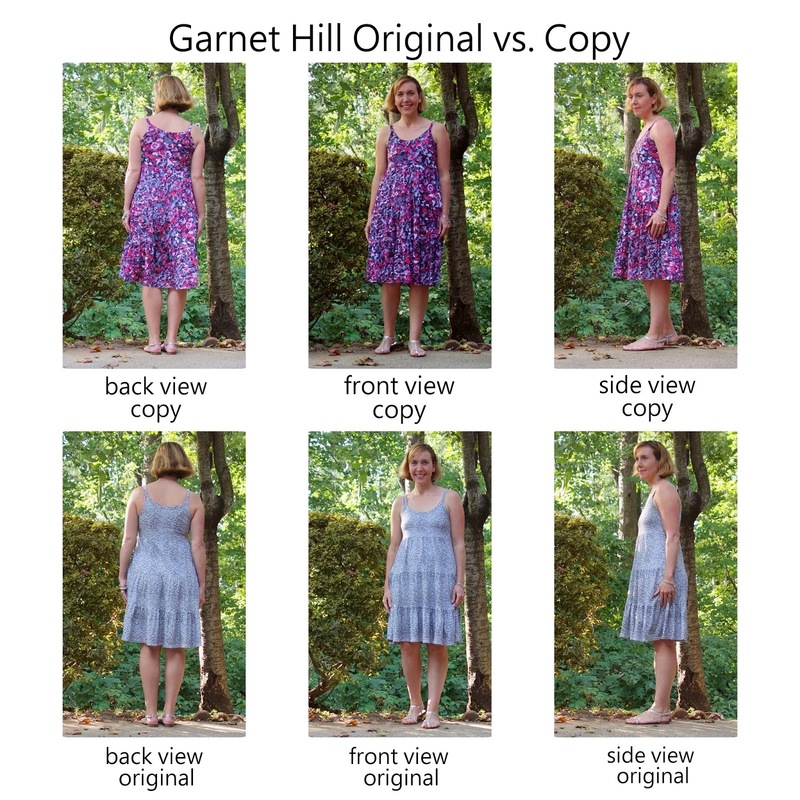 Because he was right, I *did* want another version of this dress since Garnet Hill no longer made them, and to get my hands on another version would mean my hands would actually have to do the work to construct it! But in the end, and after (I think) 16 hours of work on this project, I am far happier with this result, since I suspect actually copying from the garment you love will yield a far better duplicate. Now I own a nice paper copy of this pattern and can remake this one whenever I feel like I need another casual dressy summer sundress in my closet (and if you know anything about me, you know I LOVE a great sundress). Read more about this on Dina's Blog. Initially, I had a different plan for this weeks challenge. You can read about that mini-saga on the blog. Thankfully my plan B was an ace plan after all! I wore this outfit to run errands and go to the salon on Saturday. Ironing the top, I saw all the past shine spots from a too-hot iron...the tiny pin-prick holes that have developed...the faded color...I knew that recreating this top would be a great idea! I used the pin method to copy the pattern. The front is cut on the fold, the back has a seam. I made sure to fold it at center and traced off the front and back pieces. There are several ways to do this but I like the paper on top. This way I create a line with my pin pricks but also by indenting the paper. The curves were finished off with my French curve. I knew I was going to make Vogue 1411 out of this berry colored ponte and my fabric choice was sealed. I used this "paint splatters" jersey from Fabric Mart. 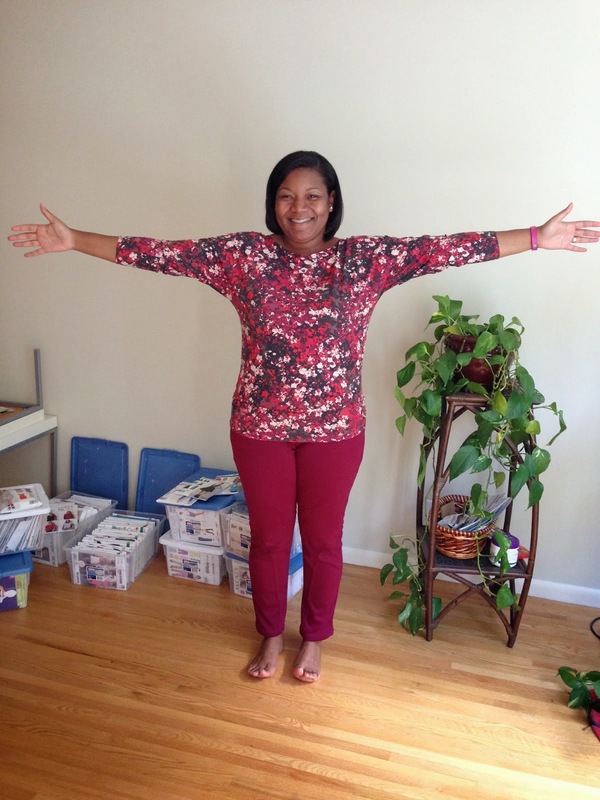 I picked it up on my last jumbo knit order and it was a perfect match to my pants fabric!!! 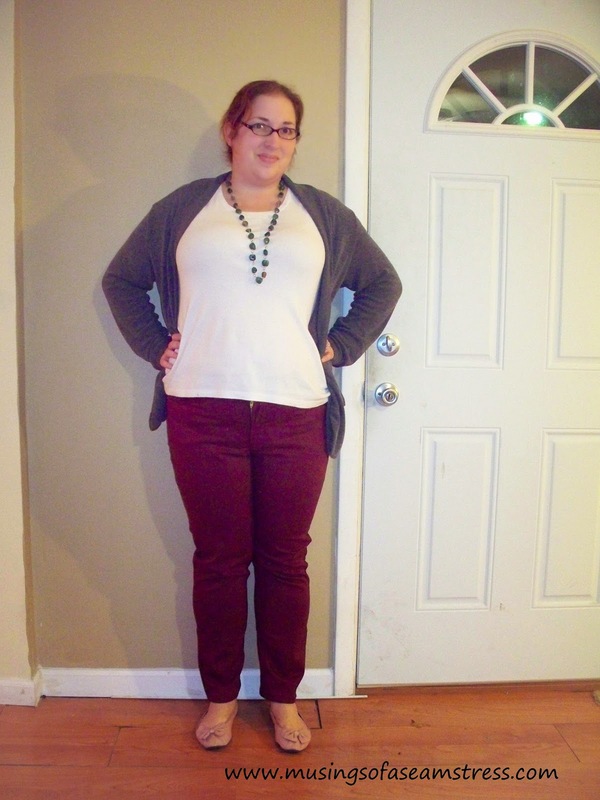 This week we were challenged to copy one of our favorite ready to wear garments. We were to use the RTW garment to get the pattern for our version. This definitely challenged me as I have never attempted this before. I spent 2 days trying to figure out what I wanted to try. I decided not to do a t-shirt because it would be too simple. The problem with that is that T-shirts make up the majority of my RTW. I thought about doing a jacket that I love but I really didn’t want to try to copy the pattern as it has a lot of different pieces. Plus I had a different idea on how to recreate that garment, which unfortunately didn’t fit within the rules of this challenge. So in the end I decided to copy my newest pair of Express Skyscraper jeans this time and I will be attempting the jacket later on. Jeans have been something on my must make list for the longest time. Why not try to tackle them now?!?! I began by searching Pinterest for different copying techniques. The first method I tries was where you put tracing/pattern paper under the garment and trace around the piece. I totally failed at this. It was not good. Then I tried the painters tape method, I found it on Cheap and Picky. This actually worked out really well. Remember earlier when I said I had never tried this before? Copying RTW and making jeans? Yay, so I don’t know what I was thinking when I decided that regardless of those two things I didn’t need to make a muslin! Possibly because I liked the way the RTW fit, but I cannot answer it because I knew the stretch of the denim was greater than the stretch of the fabric I chose. But I was stubborn and forged ahead. Guess what?!? They soo did not fit. So, it was back to the beginning. I needed to add width to the legs and I did not want to add it to the inner seam or outer seam because I didn’t want to change the pocket size nor the crotch depth. So I split the front and back legs, the waistband and the back yoke parallel with the grainline in spots where the split would go from the top all the way to the bottom without affecting the pocket or crotch depth. For the front I added 1″ and for the back I added 1/2″, because the back was already so much bigger than the front. 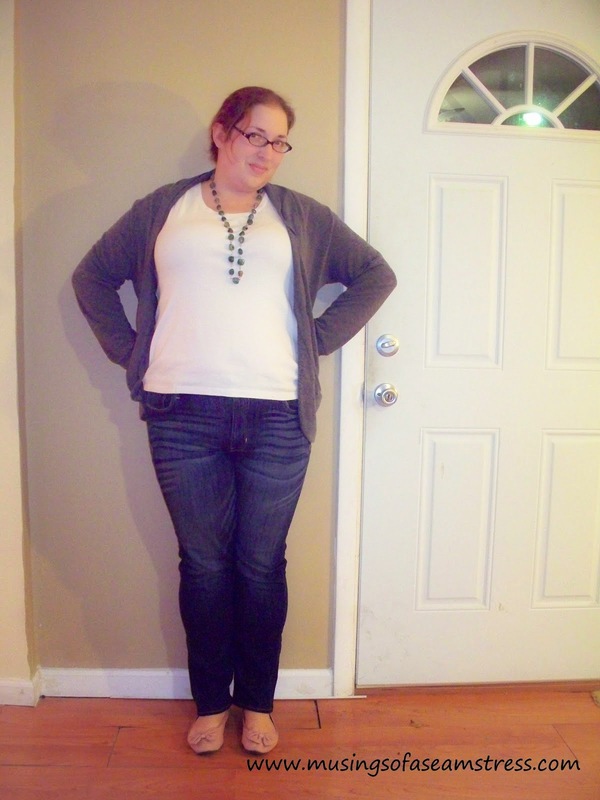 All in all, I think they turned out pretty well for my first pair of jeans and my first RTW copying experience. I would love to make these again. Luckily I wrote construction details down as I was going. Way to go foresight!! I am going to make a few adjustments to the pattern before I do that though. I want to add a little more to the center front, as these pull slightly, therefore exposing a bit of the zipper. I also want to find a better stretch denim. Holy crap! I've only ever created one garment from a RTW piece and it wasn't for me, it was for a friend. And, furthermore, I have been weeding out RTW from my closet and replacing it with my own creations, I mean why not? That is why I sew, right? To create a unique and custom made wardrobe that is not only fun to create (it is therapy after all!) but a pleasure to wear since I get to hand select the style, color, fit, and fabric. I think I am inspiring myself! So, with much nail biting and some trepidation, I set forth to make something that I'd actually want and enjoy wearing. But....there are so few things to choose from! A dress? I probably have more of those than I need. Pants? I made a pair of those last week and I need a break from pants. Top? I've also got quite a few of those and ..... Jacket? Maybe I am onto something here....keep digging in the closet and Viola! A jean jacket I've worn the heck out of is lurking about and yep! We've got a winner! I really love the contrast fabric on the cuffs, pockets, collar, and lower band. Now to decide fabric, details, and pattern. I previously made Butterick 5616, but the styling is a little off--not bad, mind you. I had something I could work with! While the pattern is boxy, I can fix that with some alterations on the style. Now for the details. I love those little pockets on the chest of the original garment. They don't add any bulk to the outside and the way the pocket bags are topstitched from the outside is pretty cool and a very clever design detail. I've never seen anything like that in a pattern and I was certain I could figure it out. Also, the pattern isn't long sleeved, but that is an easy-peasy fix by lengthening them about 5 inches. Since Butterick 5616 was my base, I pin fit the tissue to the original garment. I had to work out how to make the front into three instead of two pieces which proved to be easy. It also allowed me to make the jacket more fitted than the original as I scaled those pieces somewhat so they took the front in about 2.5 inches overall. I also had to reconstruct the cuffs and lower band and cut those in half lengthwise and create a two-pieces or a band and facing, likewise with the cuffs. Topstitching fulfills my need for preciseness--is that a word? I love to see how exact I can make it. Also, don't you think that is the hallmark of a well constructed garment? I certainly do! I copied most--about 95%--of the features that were topstitched on the original onto my garment. Oh yes, I almost forgot about that cute but pesky little pocket under the flaps. I really thought it was fun to make the pocket bags out of the cotton, just like the original. It did cause me a few head-scratching moments but I figured it out after employing my seam ripper too many times! Has any one ever seen a pattern with pockets like these before? If so, I'd love to purchase it just so I can read the directions! I am very pleased with my new jacket. I'm not sure I am ready to ditch my beloved RTW dark jean jacket, but I may have to after I wear this one! Being allowed to participate in this even had stretched my creativity and my sewing skills! Holy geez! These are great! I love seeing the ladies showcase there talent! Everyone did a good job too.